Celebrating the life of Walter Harold Hilts Jr.
Be the first to share your favorite memory, photo or story of Walter. This memorial page is dedicated for family, friends and future generations to celebrate the life of their loved one. 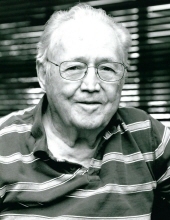 Obituary for Walter Harold Hilts Jr.
W Harold Hilts passed away peacefully on January 28, 2019, at his residence, Monaco Ridge Assisted Living, surrounded by family in his last days. Harold was born in Elko, Nevada on September 18, 1924, to Dr. W. Harold and Ruth B. Hilts, the middle of 5 children. The family returned to Reno, where Harold attended Southside Elementary and Billinghurst Junior High, graduating from Reno High School, class of 1942. He excelled in baseball and basketball, and played for the American Legion baseball team while still in high school. Harold enrolled at UNR and was the Freshman class Manager. But after the bombing of Pearl Harbor, he enlisted in the US Navy. During training in Farragut, Idaho, he met the love of his life, Shirley Coldeen of Spokane WA at a USO dance. He was then stationed at Barber’s Point, Oahu, and saw combat in the Pacific, flying off the USS Hornet in a 2-seat SBD and also SB2C as a radioman and gunner. When he war was over, Harold and Shirley were married in Spokane in October, 1945, and returned to Reno to start their married life. Four children were born to Harold and Shirley: Karen Shrader (Gordon), Gary (Ok), Kresten (Linda) and Cameron Hilts. Harold attended pharmacy school in Denver CO and was employed as a pharmacist and store manager at Hales Drug #4 at 4th and Vine Streets for many years. He retired from Washoe Med pharmacy, later working part time for Hales until his retirement from pharmacy in after 50 years. Harold was an avid hunter and fisherman, and he and family loved camping and trekking around the Nevada desert and Pyramid Lake, as well as the Sierra Nevada Mountains, especially fishing at Robinson Creek. The extended Hilts family loved the outdoors Harold made friends wherever he was due to his kind and humble ways. The family shared so many fun times, laughing and telling stories of their adventures. Harold will be very much missed by the family and by all who knew him. Harold is pre-deceased by his wife Shirley, his parents, his brothers Robert and Fred, and his sister Helen Newton Murphy. He is survived by his brother Don, sister-in-law Ruth Hilts, brother-in-law Don Donaldson, his four children, four grandchildren, and two great grandchildren. A celebration of life will be held at Mountain View Mortuary on February 9, 2019, from 11am-1pm. Inurnment will follow next to his wife Shirley at Mountain View Cemetery at a later date. In lieu of flowers, a donation to a favorite charity is suggested. To send flowers or a remembrance gift to the family of Walter Harold Hilts Jr., please visit our Tribute Store. "Email Address" would like to share the life celebration of Walter Harold Hilts Jr.. Click on the "link" to go to share a favorite memory or leave a condolence message for the family.